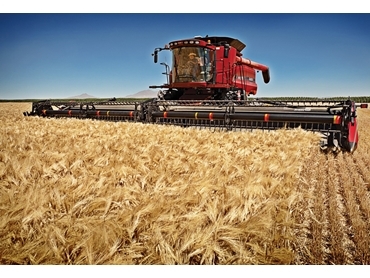 Case IH is celebrating 35 years of its unique Axial-Flow combine harvester technology with the launch of a new generation, the new 30 Series Axial-Flow. With three models in the 130 Series and three models in the 230 Series, the new range of combine harvesters offers benefits like enhanced power and in-field performance and reduced fuel consumption. All combine harvesters in the new 30 Series deliver excellent fuel economy, responsive horsepower and enhanced productivity. Improvements have also been made across the entire series to ensure easy setup for changing conditions. Settings are adjustable at the touch of a button to enable adaptability between varying crops and conditions. With lightweight threshing and separation concaves easily accessible and easy to change, the 30 Series can take on any crop. To further add to the versatility, the self-leveling cleaning system can compensate for angles of up to 13 %, making it easy to harvest on hilly slopes. For unloading on the go, the length of the new unload auger system on the 7230, 8230 and 9230 has been increased to ensure a comfortable distance is maintained between the header and chaser bin. The new impressive 9.3 m unloading auger is designed for 13.7 m header widths. The new range also comes with a standard grain tank and unload system featuring a dual drive for the cross augers and unload tube augers. Operator comfort is a given with the 30 Series delivering the quietest cab on the market. In addition, all models incorporate the state-of-art AFS Pro 700 display for yield monitoring, machine and guidance control. The 30 Series will be relaesed in May 2012. Operators are advised to order now to secure supply.